Arby's has (finally) upgraded their web site. 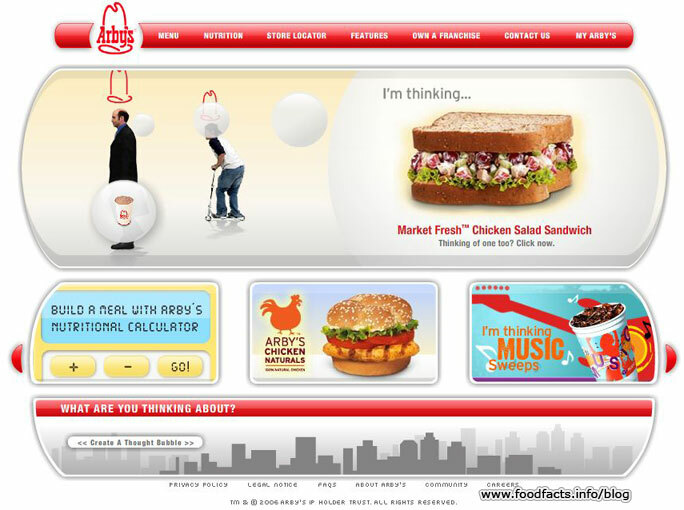 The new site reinforces Arby's "I'm thinking..." ad campaign. There's a constant stream of various characters moving across the top of the screen and when you put your mouse over them you can see what Arby's item they're 'thinking' about. Unfortunately there is no way to turn off the annoying and repetitive sound effects on the opening page of the new site. I can't keep the site open in another window while I write this because it's just too damn annoying! 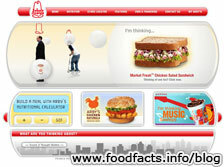 The middle section of the main page has links to standard fast food site sections: nutrition information, restaurant location finder, sweepstakes entry, and franchising information. At the bottom you can create your own "I'm thinking" thought bubble that will float up the screen for you and any other current visitor. You input your name, state and choose from a selection of comments about an Arby's menu item of your choice. I created the one at the left. Overall, it's a good site that's pretty easy to navigate. Just let us turn of those annoying sound effects! Thanks to Arby's not bothering to advertise their new Gyro sandwich, I only recently found out about it. They were delicious! I was going there twice a week for them and then suddenly they quit carrying them. Bastards! Forget about the gyro and I object to the commerical About the chicken nugets. It is very obvious these guys are not talking about nuggets but about someting else. Please have it removed.